Our expert designers are passionate about creating custom solutions for each of our clients, whether you need carpet, hardwood, or laminate flooring. We even offer cabinets and granite surfaces as well. We don’t provide a one-size-fits-all service – every project is unique, and we’re committed to creating a design that satisfies you. Since convenience is so important to us, we even offer a unique in-home shopping service at no extra cost. We’ll bring you a selection of design options to look at, and you can consult with our expert designers without leaving the comfort of your living room. We also offer a free in-home estimate for your project, and you will get total price transparency from the beginning of the design process all the way to putting together the final touches. Unlike many other flooring services, we do not work with third-party contractors. We have our own installation team made up of experts who have been hand-picked by our staff for their dedication and performance. By keeping everything in-house, we are able to offer high-quality services that keep our customers satisfied. In fact, we are so confident in the quality of our installation that we offer a lifetime guarantee. During our decades in business, we’ve helped over 300,000 customers create spaces they love. Our extensive experience sets us apart from other flooring companies in Los Angeles County, Orange County, and Riverside areas, and we pride ourselves on having one of the most comprehensive selections of flooring and cabinets in the area. We have worked on a very broad range of projects, and are proud to have built such a large base of satisfied clients. We offer fair pricing options that include free installation with a lifetime guarantee, and 0% financing for five years. Contact us today via phone or email to learn more or schedule your first appointment. We’re looking forward to helping you build a space you love. Yes! We’re happy to come to your home, measure your room(s), and provide you with a realistic, in-depth quote for your project. This service is free of charge, and there is no commitment. Don’t like our quote? Just send us on our way! 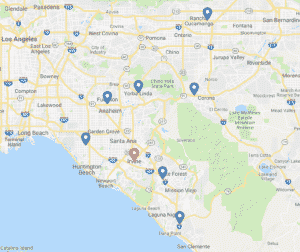 We have 7 convenient locations spread throughout the greater LA and Orange County area, including Riverside and San Bernardino. What If I Don’t Like My Carpet? We have a 100% customer satisfaction guarantee. Not happy? We’ll replace your carpet within the first 30 days – no questions asked! We are extremely pleased with the quick and quality of work completed by this team. We absolutely love the carpets! We requested they install and was done all in one day, they moved all furniture and cleaned up afterwards. We would definitely recommend this LA Carpet team! Our sales rep HIRBOD was very helpful and responsive by providing us new carpet in our house and new laminate floors at our sons condo. We received special financing to make our jobs even more affordable. Thank you Hirbod and to your installer Manuel and his partner who did a great job, they were very clean very fast and very courteous. Our second time back to them for flooring. They do a great job. Reasonable prices and on time service. Andy was very helpful with different options. LA Carpet works with only the best manufacturers to offer a variety of high quality products at the best prices. Shop with confidence knowing that these products are handpicked by the professionals at LA Carpet for their durability, quality, and affordability.